FILE - Germany's Christian Democratic party's, CDU, general secretary Annegret Kramp-Karrenbauer gives a statement in Berlin, Oct. 28, 2018. The German chancellor’s protege, Annegret Kramp-Karrenbauer, is seeking to step out from her mentor’s shadow and shed her "mini-Merkel" nickname, saying she wants to restore voters’ sense of belonging to a German homeland. The influx of 1.6 million refugees and migrants since 2014 is widely seen as having doomed Merkel’s fourth term in office. She plans to finish her term as chancellor, due to end in 2021, but there are rising doubts whether she will manage to do so. Many observers don’t expect her "grand coalition" government to survive amid mounting signs that the Social Democrats may decide to walk out of the fraying governing alliance next year. 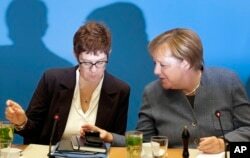 FILE - German Chancellor and chairwoman of the German Christian Democratic Union (CDU), Angela Merkel, right, and Annegret Kramp-Karrenbauer, left, secretary general of the CDU, talk at meeting in Berlin, Germany, Nov. 4, 2018. Kramp-Karrenbauer is considered the most liberal of the contenders and the most in tune with Merkel’s centrism. So her acknowledgement on the importance of a "sense of belonging" is being seen as an appeal to more conservative party activists, who have long chafed at Merkel’s march to the center and her wooing of Social Democrat voters. A devout Catholic, she will need to court all sections of the party if she is to beat her biggest threat, Friedrich Merz, a politician-turned-businessman and an old Merkel rival. The 62-year-old Merz left active politics in 2009 for a lucrative career in business and finance after losing to Merkel. He has been a conservative darling, fondly remembered by them for arguing that immigrants should assimilate and adopt German culture. He is seen as unpredictable and has been labeled a "conservative disrupter" by the German press. FILE - German conservative Friedrich Merz arrives for a news conference about his candidacy to succeed Chancellor Angela Merkel as leader of the Christian Democrats, in Berlin, Germany, Oct. 31, 2018. According to business newspaper Handelsblatt, Merz would change the CDU, turning it into the “party of law and order instead of friendly selfies with asylum-seekers - the party of churchgoers, entrepreneurs, and, above all, the party of men.” Most German commentators accept as inevitable that if Merz is elected, it would be impossible for Merkel to finish her term. “We have to tell the people in this country that the Germans have to contribute more than others to the success of the European Union,” Merz said at an event held by a research group this past week. “We have to do more than we are actually doing because if Europe fails - and this is a clear option, no one can deny it, Europe is really at the threshold at the moment - if Europe fails, the Germans will be those who suffer most from that,” he added.